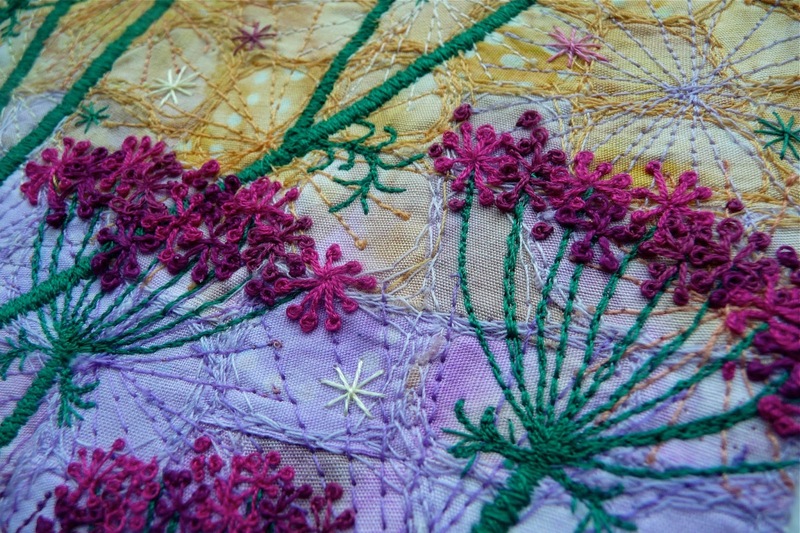 My passion is hand and machine embroidery; nature-inspired and colourful. 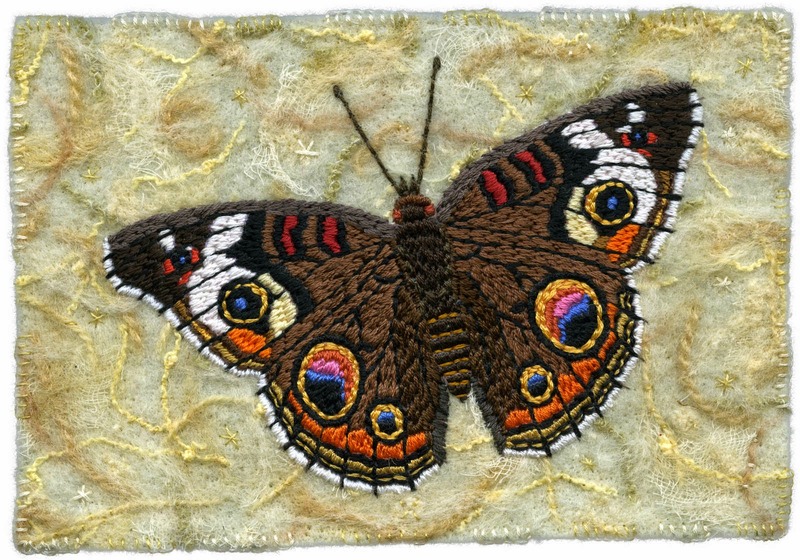 My surfaces: fabric collage, quilting and needle-felting. Vancouver, BC, Canada. 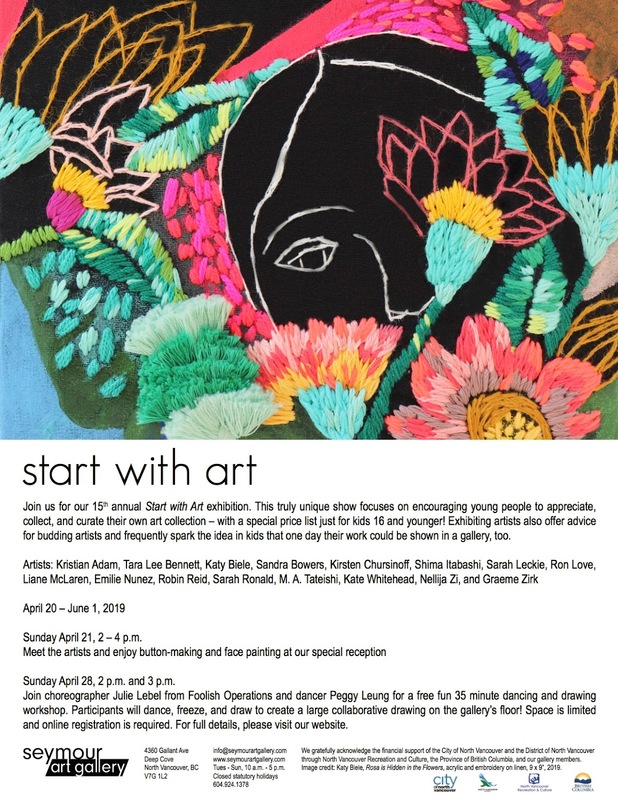 I'm excited to announce that I'm participating in the Start with Art exhibition at the Seymour Art Gallery. 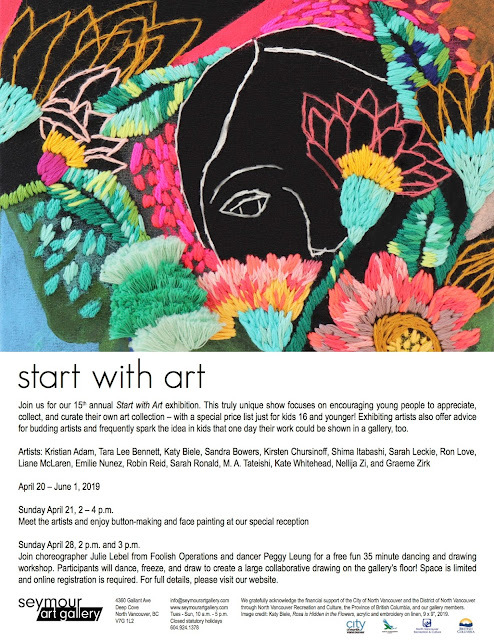 Join us for the reception April 21, 2019 2-4pm. 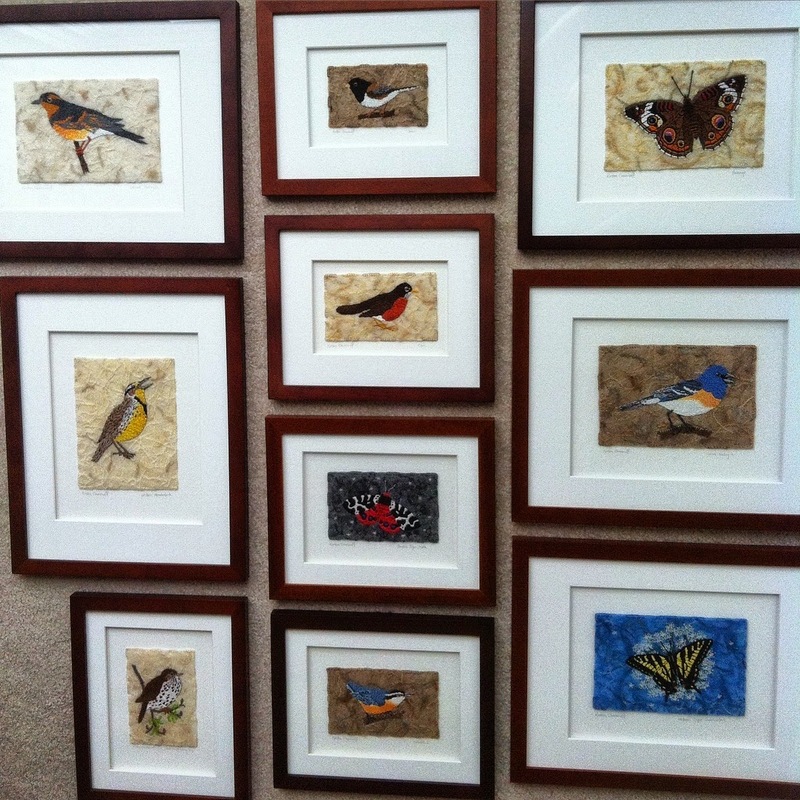 I will have 12 embroidered pieces, mostly bird portraits and a couple of butterflies. Top: detail of Hollyhock Garden. 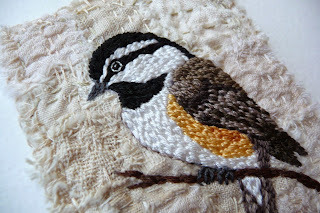 Bottom: detail of Little Chickadee, by Kirsten Chursinoff. My Painterly Stitches exhibition is now open! 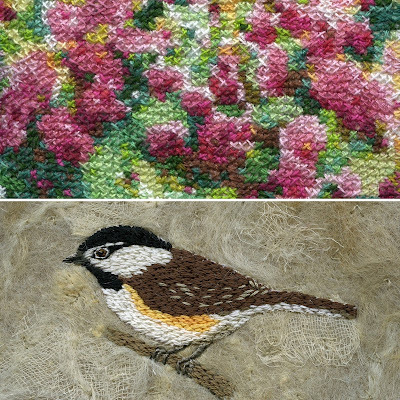 With a painterly approach, and a full spectrum of needle art techniques, Vancouver artist Kirsten Chursinoff presents her nature-inspired textile art. 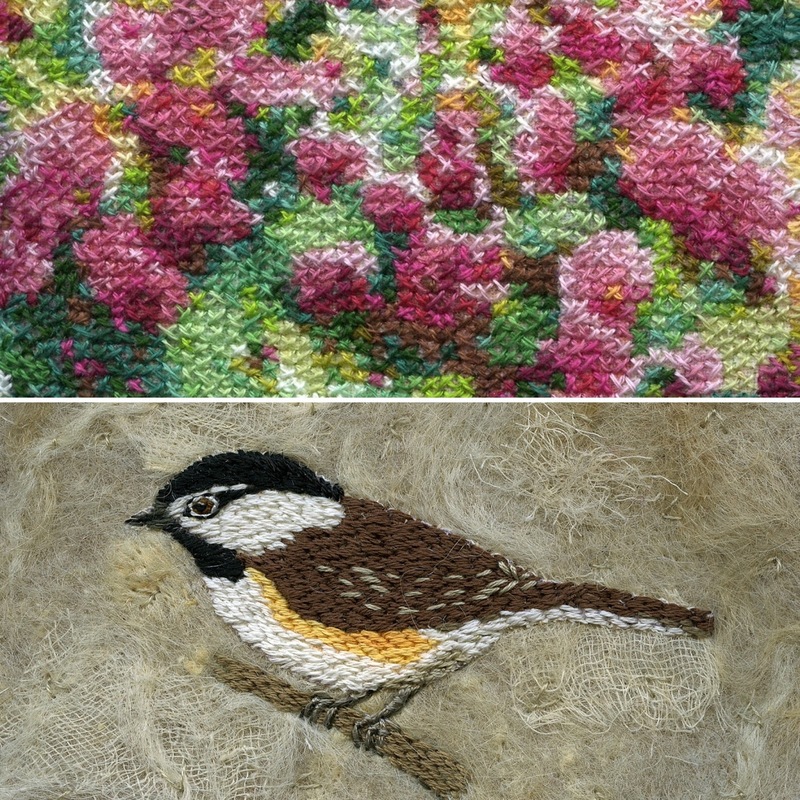 Birds, flowers and landscapes are depicted using hand-embroidery stitches, or expressive free-motion machine sewing. The base fabrics are quilt-like, needle-felted, or altered paper. Monday – Thursday 10 a.m. – 9 p.m.
Sunday (September – June) 10 a.m. – 5 p.m.
We are closed Sundays from July through Labour Day. Over 30 pieces displayed on the main floor and lower level of the library. Use elevator or stairs to access the lower level. Slide show and artist talk at the West Vancouver Memorial Library, Welsh Room, June 22, 7-8pm. ***I will have 2 pieces in this exhibition. 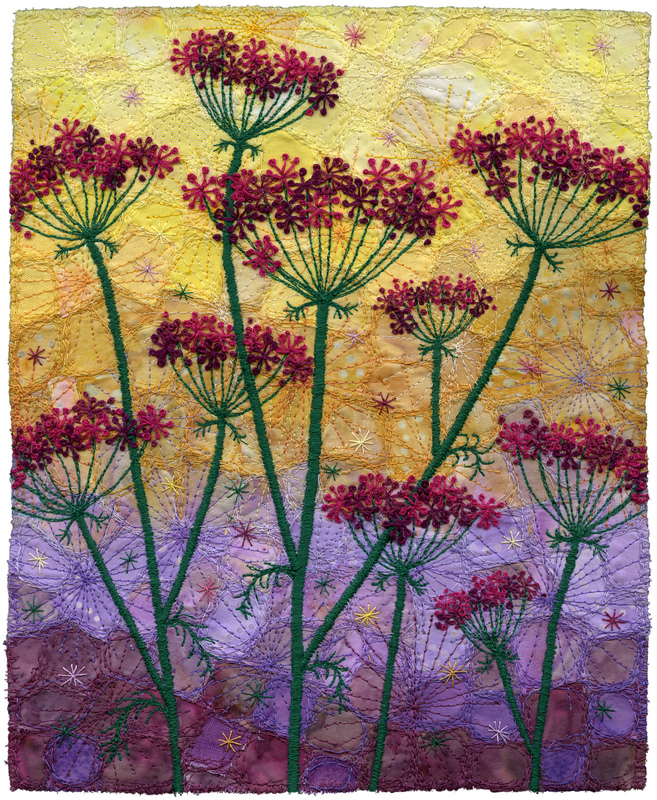 My demo is scheduled for Sunday April 3, 1-3pm and is titled "Breaking the rules with hand stitching." I'm excited to share some of the events on my calendar this year! Demo at Silk Purse, date to be confirmed soon. 2 group shows to be confirmed soon! Please note, there is no opening reception. All sales from this exhibition will be handled directly by me. You can read my answers below. What do you like most about embroidery? materials can lead to a complex outcome depending on your approach. Where do you gather most of your inspiration for your work? ideas about composition and ways of seeing the world. What is the main challenge you face when beginning a piece? not even show in your final design, but it gives you a starting point. drawing is not your strongest skill. What are your goals for the future (as an artist)? exhibiting my work and speaking to embroidery and textile art guilds. I have two small children, so hand embroidery is my passion right now. It's easy to pick up and put down when I have a few moments to spare. “Hi, I am a textiles student based in Manchester and I am really interested in your work and what processes are involved with your work. We have been asked to speak to artists that will be potentially further influencing our work which will go towards an essay. If it is possible could I ask you a few questions for my research? I am really interested in your use of surface texture on all of your pieces of work. Is it both hand embroidery and machine embroidery that you use on your work and what kind of imagery inspires your work? Also what artist originally inspired you when you began making work of your own? Is there a particular shape or pattern that has influenced the way in which your work forms? Lastly, what media do you use on a regular basis and what do you use to create your original surface before embellishing it? 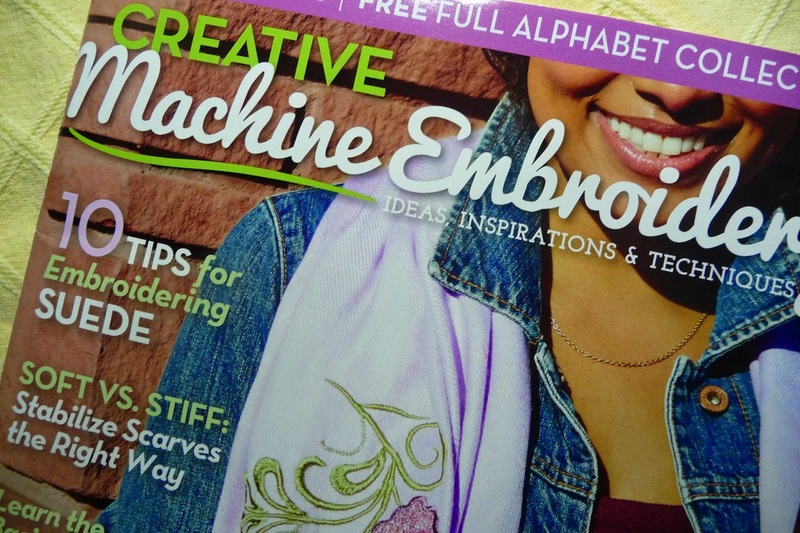 Is it both hand embroidery and machine embroidery that you use on your work? Yes. I try to blur the boundaries so that you really have to look closely to see where one ends and the other begins. What kind of imagery inspires your work? Primarily nature. Occasionally I drift into the abstract realm. What artist originally inspired you when you began making work of your own? Kaffe Fassett was a huge inspiration, especially for colour use. I stumbled upon his early needlework and knitting books at my local library. 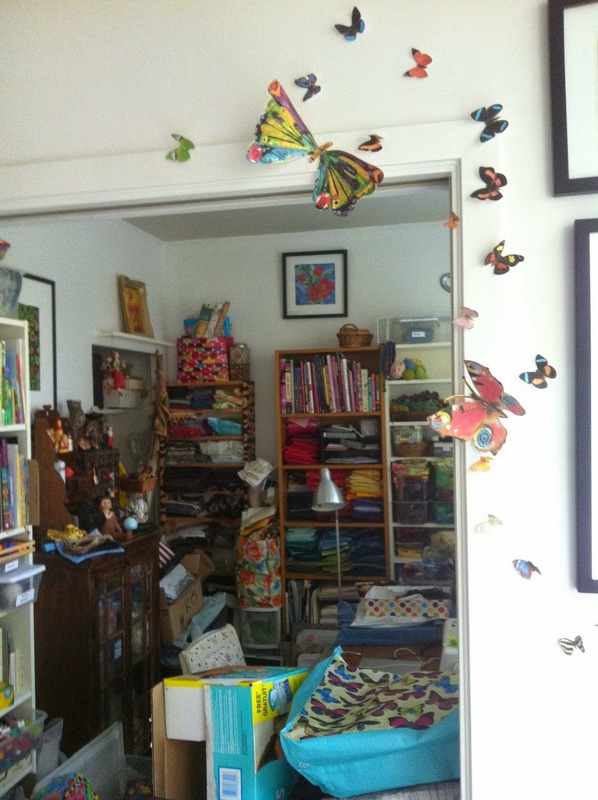 This was before I knew about the wonderful world of textile art. Then it was the work of Jan Beaney and Jean Littlejohn. They stimulated my passion for combining many techniques in one piece of art, and fed my hunger for texture. Is there a particular shape or pattern that has influenced the way in which your work forms? I love early textiles and tribal patterns, but you won’t see much evidence of that in my work. Texture, more than pattern, is an important element for me. What media do you use on a regular basis? Cotton quilting fabrics, embroidery floss, sewing thread, decorative yarns, cheese cloth/scrim, wool for machine needle felting and sometimes beads. I avoid some of the trendy materials, with the exception of water-soluble material for lacy effects. 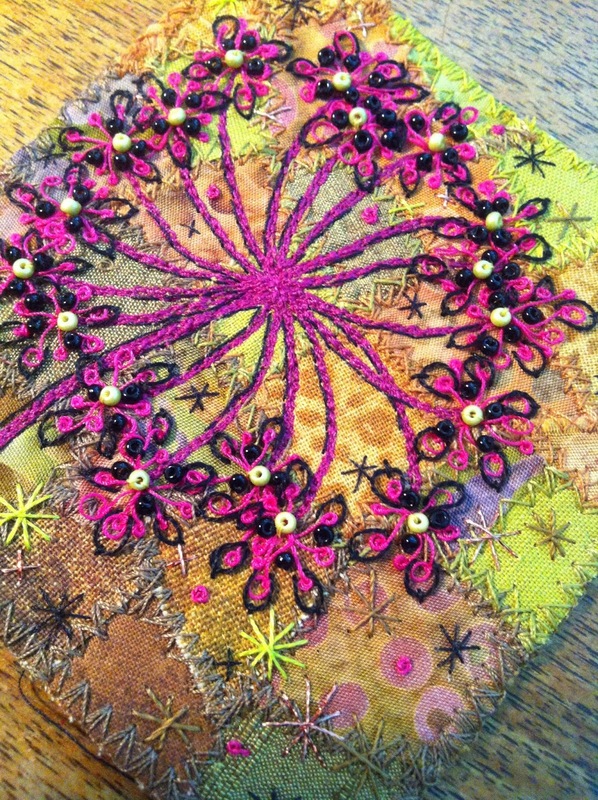 What do you use to create your original surface before embellishing it? Tiny scraps of quilting fabrics come together with machine free-motion stitching onto a base of cotton canvas (duck), or I sometimes needle-felt by machine to create a textured base for hand-embroidery. My boys have been keeping me busy, but I do have a few things to say. My website address now redirects here to this blog. I can update everything on this page myself, so things are easier this way. I wasn't getting a chance to update over there. Also, if you'd like to connect on Facebook I have an artist page so look for me as Kirsten Chursinoff, Textile Artist, and you can like the page. For now, I approve friend requests on my personal page for people that I actually know, so liking my Artist page is the best way. 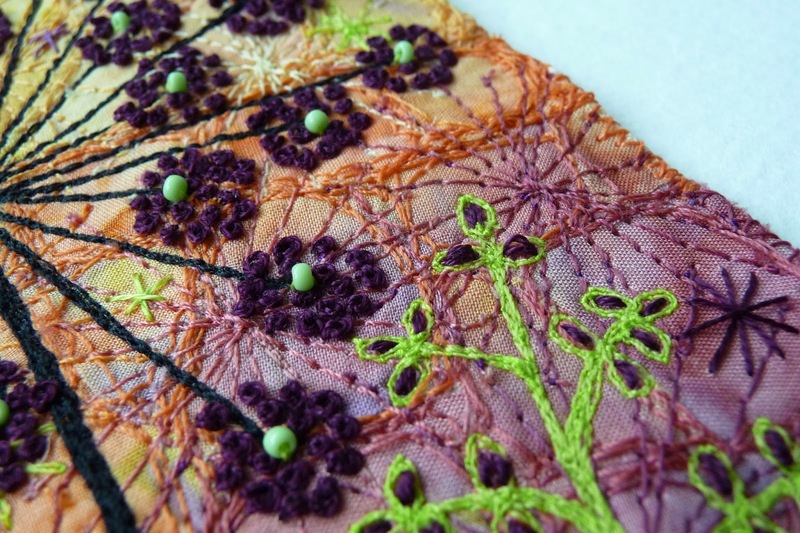 Lectures and Workshops for lovers of all kinds of textile art. I still have a studio, but it's buried right now. Reworking this one a bit! Wishing I had more time for art. Autumn is such a great time for inspiration. Life is busy with two little boys, so it's nice to have a little something to talk about. 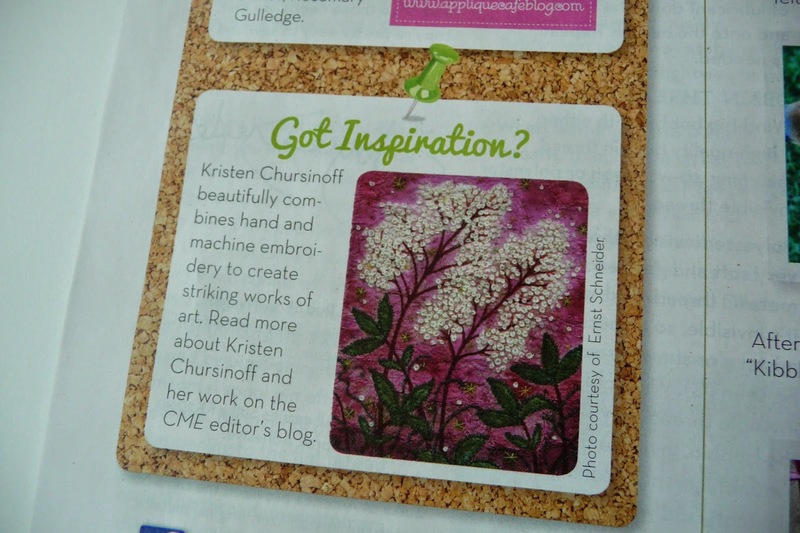 My Meadowsweet piece made a small appearance in the May/June 2014 issue of Creative Machine Embroidery Magazine. Please ignore the typo. Unfortunately my name is misspelled! 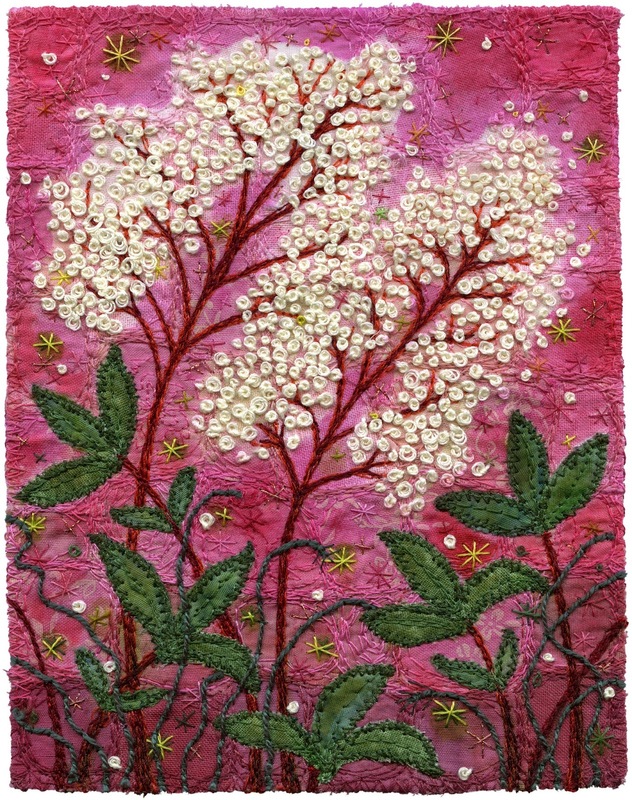 I tried something new with the Meadowsweet. I made my usual background out of a hundred or so scrap pieces, but then I added colour with Jacquard Textile paints. I painted after most of the stitching was complete. You can see the glowing effect around the blossoms. I darkened the area just outside of the stitched blossoms. 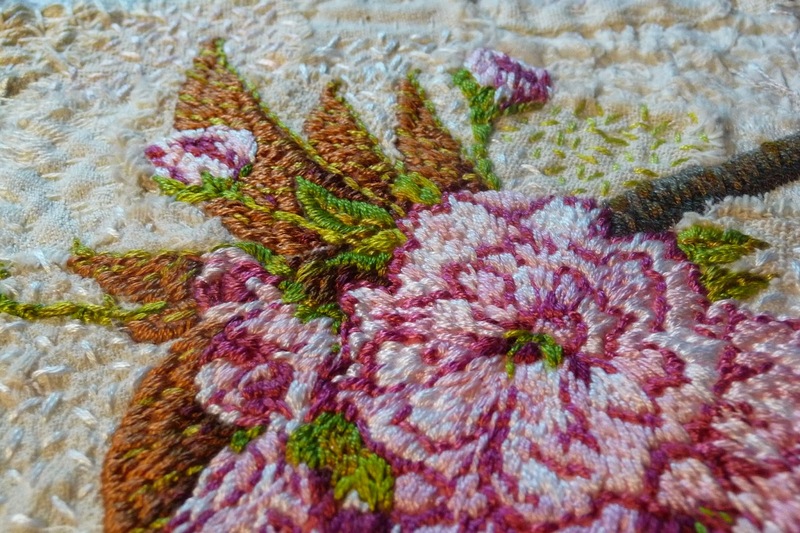 French knots (in my loopy and loose way), appliqué, free-motion, couching. The plant does have red stems, which are fun and rather vein-like. Hello! I'm part of a group show and I'll be doing a hand-embroidery demo this Sunday afternoon, 1-3pm Sunday April 13, 2014. There are various demos on weekend afternoons for the duration of the show. 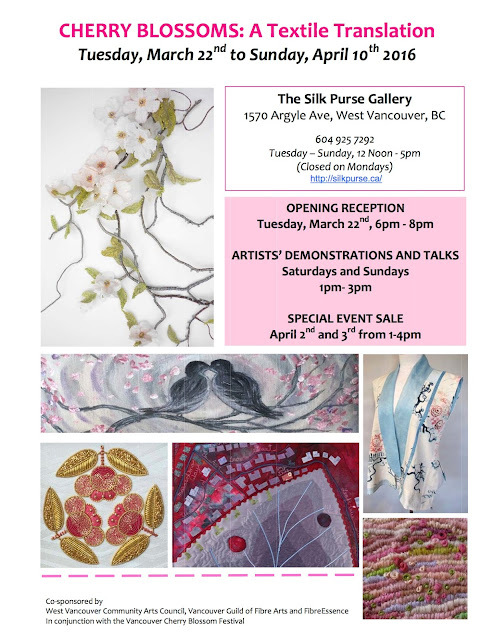 "Vancouver Guild of Fibre Arts & textile art collective fibreEssence are delighted to offer the 6th annual juried exhibition of textile art inspired by the cherry blossom. As part of the Vancouver Cherry Blossom Festival, the exhibit is ever-changing, thought-provoking & breathtaking; unfolding as the blossoms blanket Vancouver. Artists from across Canada, the USA & Japan have created an international celebration of a very special spring event. Ranging from whimsical to heavenly, works include delicate images on silk, robust sculptures, textile books, & wearable art." Interested in all creative pursuits involving fabric and thread. Artist and mom. Vancouver Canada. Copyright Kirsten Chursinoff 2016. Simple theme. Powered by Blogger.